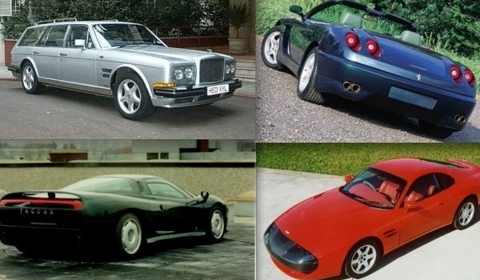 Just a general question for all petrolheads; who has the biggest and most expensive car collection in the world? Exactly, it is Hassanal Bolkiah, the Sultan of Brunei. He is the proud owner of the world’s most unique car collection. Total price of the collection containing 7,000 high performance cars is $ 5,000,000,000. He is the owner of a Porsche 959, Porsche Carrera GT, Lamborghini Diablo Jota, Lamborghini Murcielago LP640, Bugatti EB110, Bugatti Veyron (regular and Pur Sang edition), Maybach 62, Jaguar XJR-15 and six Dauer 962s. But that is not all. He also owns six Ferrari FX models, the original red show model of the Bentley Continental R, the only Porsche Carma, the only Koenigsegg Agera CC GT, two fully operational Ferrari Mythos concept cars, both of the Ferrari 456 GT Sedans, the only right hand drive Mercedes-Benz CLK-GTR in the world, five McLaren F1s including both black LM models and three Cizeta-Moroder V16T cars, 10 out of 77 made Aston Martin One-77s, the only convertible Aston Martin DB4 GT Zagato, and the only Cicero BDB Maestro ever built. According to the Daily Mirror, as of June 30th 2010, he owns 604 Rolls Royces, 574 Mercedes-Benzes, 452 Ferraris, 382 Bentleys, 209 BMWs, 179 Jaguars, 134 Koenigseggs, 21 Lamborghinis, 11 Aston Martins, and 1 SSC. The complete collection is stored and serviced in five secret aircraft hangars, where specialist teams from the various manufacturers maintain it.